Tuesday Menu - Chicken Chimichanga is great. Love the cheese sauce and the meal was delicious. Very large enough to have a couple meals from it for only 5.95. Definitely will get one again. For lunch I went to the sports bar Burkel's which is located on the West side of Green Bay. 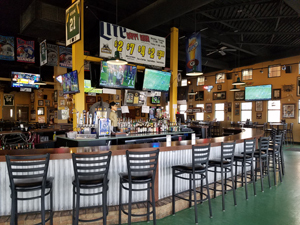 It is a large bar/restaurant with vaulted ceilings with numerous Packer memorabilia. The huge bar plus all the tables are shaped like a football, and there are many TV's situated throughout. The front of the bar/restaurant have massive windows which look out to their outside patio. I was greeted in an exuberant friendly manner and was soon given a menu and was told of the specials for the day. 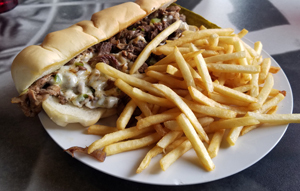 The menu was hearty pub food and I decided on the Philly steak sandwich for $9.99. The sandwich consisted of shaved beef, sautéed fried onion, green peppers, and mozzarella cheese on a hoagie bun. You have a choice of French fries or potato salad and I chose the fries. My Philly sandwich arrived and it was a monster sandwich with a huge amount of fries and dill pickle spear on the side. The sandwich was piled high with tender delicious shaved beef with no fat placed on a hoagie bun that was very fresh and soft which made the sandwich easy to consume yummy. I asked for mustard and they have the brown spicy brand which I was happy to have. The French fries were done to a light brown with a lot flavor. My waiter had a very happy demeanor and was very efficient which made for a satisfying lunch.